Three Glasgow City players have been selected for the upcoming Scotland Under 19 European Championship Elite Round Qualifiers in Holland. Defender Eilish McSorley is joined by Midfielder Emma Mitchell and forward Lisa Evans as part of an 18 strong Scotland squad who will head out tomorrow to the Netherlands, who host Scotland’s Group. The winner of the group will join hosts FYR Macedonia, and the first placed teams from the five other groups, at the finals from 24 May to 5 June 2010. The runner-up with the best record will also secure a place at the finals. 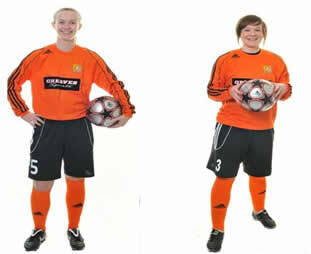 Left to right - Lisa Evans, Eilish McSorley and Emma Mitchell.